Do you ever get a gut feeling about some jobs? I remember going to measure up for some fitted cupboards some time ago and getting the distinct feeling that no matter how hard I tried the client would never be satisfied. My persivearence paid off eventually and that is what happened when our editor asked me to try out these Trend router cutters. I've never needed to make butterfly joints before and the only time I recall seeing them in the flesh was on Arts and Craft furniture. They were used on tables, partly as decoration, but mainly to help hold the joints together between the boards on the top. these unusual joints. But I was in for a shock; this is a routing operation that requires very precise setting up. There are seven faces to this joint and they all have to fit neatly together. To find out how difficult it is to make these butterfly joints I set about making a simple shelf to hold CDs. 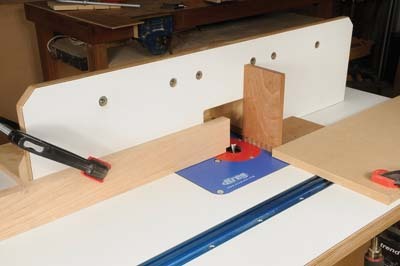 I wanted to use only the table router because much has been written about it recently and I presume most of you have one. 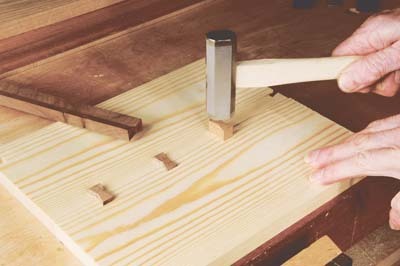 They're simple to set up and most things can be done without making yet another special jig. The butterflies are made from American walnut (Juglans nigra) and the shelf parts are made from ash (Fraxinus excelsior) as this forms a contrast and makes the joint more visible. I would strongly recommend the use of test pieces for this joint as it's not for the faint hearted. 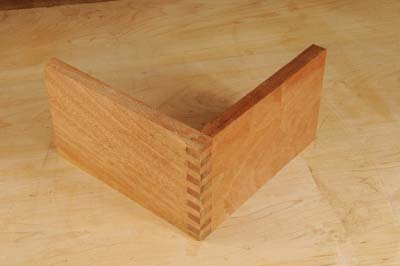 There are two ways to set about this joint and I chose to cut the dovetail shaped sockets first and make the butterfly splines to fit it. 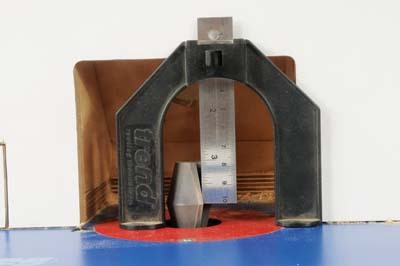 The height of the cutter must be set to exactly half the length of the butterfly, 12mm. I have a 90 degree template for vertical work that can be used on the saw or router. By cramping the end piece on the jig I could feed it onto the cutter, the jig needs to run in a track or between the fence and a strip of wood. This is because the cutter kicks the wood away from the fence and must be fed onto the cutter as slowly as possible to avoid break out. 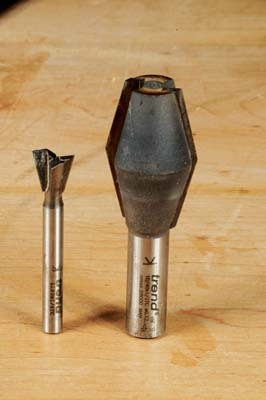 Although the cutter is only about 12mm in both directions, it can still drag the wood out of your hand in the most brutal way if you're not prepared for it. 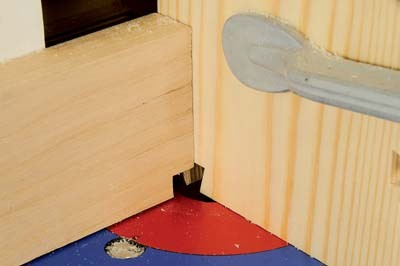 A stop is important because the cut is not right through the end piece, but as deep as possible. The way I set the joints out meant I had to alter the position of the fence several times. 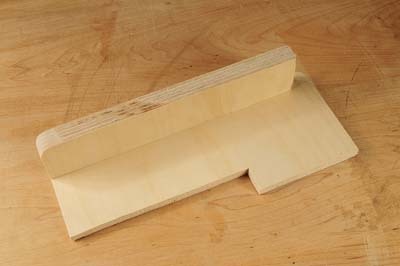 In future I would think about it more carefully and make the ends and the shelf the same width, to be able to cut more of the dovetail shapes on the same setting and then trim them to size. My lack of fore-thought meant I had to mark these cuts carefully onto the shelf and back piece, then line them up centrally with the cutter. 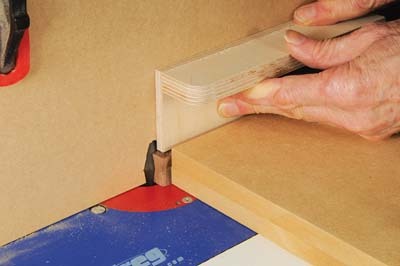 The shelf and back was laid flat on the router table to make the cuts, leaving the height of the cutter in the same position. The cutter supplied for this has a 1/2 in shank and is much larger in length at 46mm. 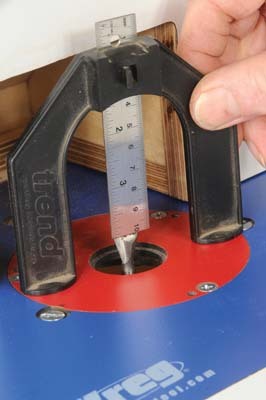 By the time you read this Trend will have increased their dovetail cutter range to allow for larger splines to be used. I would think it's essential to have a choice and to be able to make bigger butterfly joints. I set the centre of the cutter exactly to the length of half the joint in height. Then by adjusting the fence a few times I managed to get the butterfly to fit the dovetail. Extreme care and patience is required at this stage and I spent longer doing this than any other part of the operation. The cutter works well across the grain but it still needs a second fence to keep the size consistent and it's now quite fragile because of being short grain. A custom-made push block allows constant pressure to be applied to this fragile component. After cutting a few butterflies from this section I was able to dry fit the shelf together and check the accuracy of my setting out. Next, a quick sanding and it was ready for gluing up. The end sections were left square to make cramping up as easy as possible and shaped after the glue had set. Previously I said there were two ways to set about this joint and the other way is to make the dovetail cut to fit the butterfly, on reflection I think that it would be even more difficult than the way I chose. This is far from being an easy joint to make, there are so many variables to take into account and precision is required at every stage. Is the result in the end worth the effort? I'm not sure, it looks fine, but it's more than decoration, it has to form a function and hold the various parts together. In Bill's Arts and Crafts style furniture he uses embellishments that are functional as well as decorative. 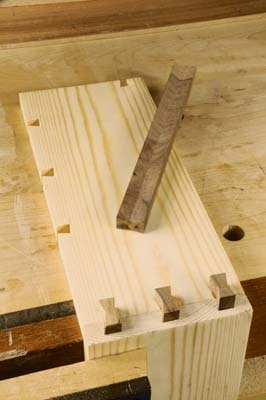 Instead of a dowel to pin a mortise and tenon joint, he'll use a peg that's raised and chamfered. Likewise the butterfly spline is decorative, while also providing structure. 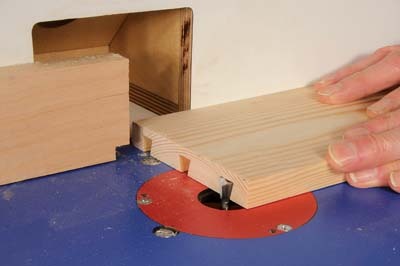 He makes a router template to create the spline itself as well as the slot that will receive the spline. 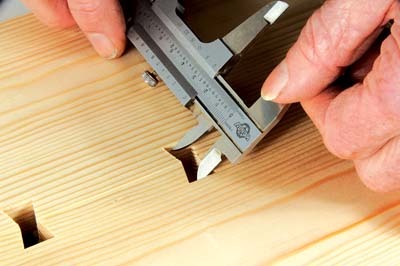 There's no limit to the shape of the spline which will often be determined by the grain of the wood. 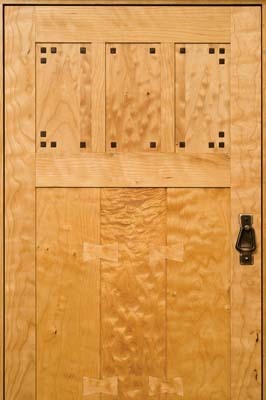 Bill will be exhibiting at the Vermont Fine Furniture Festival in Woodstock, VT- Sept. 24-25, 2011. For more information visit the website. 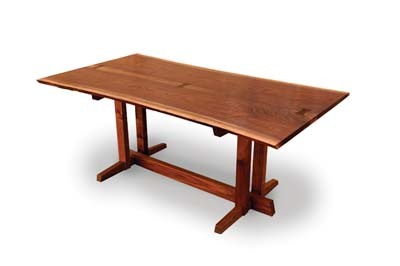 In addition to makers associated with the Arts and Crafts style George Nakashima's work features butterfly ties to great visual effect although this is not the primary reason for using them. His style is distinctive, he approaches construction with an integrity for the material and a sympathetic ear to what was once a living thing. Symmetry, balance and proportion are interpreted differently as he seeks to produce pieces that are every bit a part of the life cycle of this incredible resource.